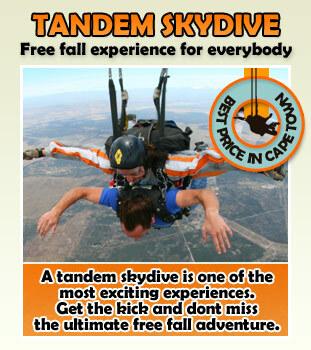 Experience free-fall adventures under the African skies facing Table Mountain! There are only a few places where you can celebrate skydiving at lower costs and with a blue sky guarantee! 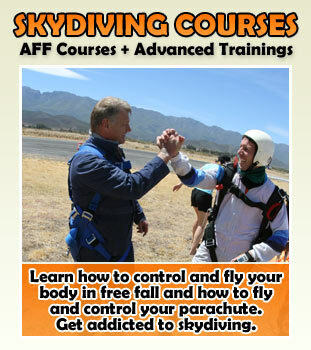 So if you want to get stoked - visit us - we sky dive all year round, every day without winter break! Plus you get an extra cool holiday! Our drop zone is located in one of the most fascinating cities in the world: Cape Town! With all its top spots under the african sun like Table Mountain and beautiful beaches, just to name a few, Cape Town will make your trip a perfect one! Our guests stay either at the Sky Lodge close to the drop zone or at House on the Hill which is situated directly in the city centre of Cape Town South Africa. Both accommodations offer the same standard. Our rooms are partly with en-suite, otherwise one bathroom is shared between 2 rooms. The accommodations provide a fully equipped self-catering kitchen, bbq(braai) areas, safe-deposit boxes and for a little extra: laundry service and internet access. Shopping centers are within walking distance. In the evenings you can either have a braai, the south african way of bbq or you visit one of the restaurants in the area to enjoy African-style dishes, it is worth it, we promise. To the party people out there, we highly recommend Cape Town's nightlife which has something to offer for every taste.